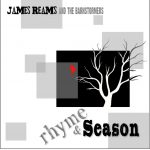 Rhyme & Season is the newest album from James Reams & The Barnstormers was released on March 29, 2016 and features band members from both his west coast and east coast bands with special guest and renowned fiddler, Kenny Kosek, on selected tracks. Click on the album cover to watch the “Making of Rhyme & Season” video. Check out these short music clips from the album. Click here to read more about this project. James sat down with DJ Darwin Davidson, host of WERU’s popular Bronzewound program, at the 2016 World of Bluegrass Conference to chat about the new album, Rhyme & Season. The interview just aired in January, 2017 and features 3 songs from the album. You can listen to the interview by clicking on this link: WERU Interview. The video tells the story of a man who sought perfection in love and ended up alone. As James plaintively sings this emotional song, we see him remembering happier times dancing with his sweetheart to this same tune as kids. He returns to the holler where they once lived and finds their cabin locked up, just like his heart. It isn’t until she’s actually gone that he’s able to let go of the idea of the perfect woman and go after her. 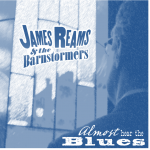 “Almost Hear the Blues” is included on James Reams & The Barnstormers’ 8th CD entitled One Foot in the Honky Tonk released in 2011. This CD made two Top Ten CDs of 2011 lists. 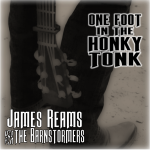 CLICK here to watch James’ latest full-length music video, the title track from his album “One Foot in the Honky Tonk.” Once again James has teamed up with Rick Bowman from Backyard Green Films in this creative effort. The video reveals what happens to a hard-livin’ musician who doesn’t have his priorities straight. One day he wakes up to find that he has “one foot in the honky tonk and the other in the grave.” Keep a watchful eye out for the devil, he shows up in many guises! Once again, James has teamed up with talented director Rick Bowman of Backyard Green Films to create this video. To read more about the album, simple click on the Recordings menu on this website and select “One Foot in the Honky Tonk” from the dropdown. The album can be ordered directly from the Recordings menu or from CDBaby.com.